"Another uncouth lout falls between my fists and the street." Dudley comes from a wealthy English family. His father was a celebrated athelete and businessman, and Dudley knew no hardships growing up. When he was little, Dudley had wanted to be a fighter, but his family had discouraged him because of his small stature. However, his father's business failed when Dudley was in college, so Dudley seized the opportunity and stepped into the ring to earn his father's money back. What he did not know is that his father's wealth was due to underworld ties, and that Gill had actually repossessed all of his family's possessions. Dudley was successful in earning back most of his family's wealth, and eventually graduated and became a businessman himself. However, one thing still bothered him: his father's Rolls Royce, which was still in Gill's possession. The car had been his father's favorite, so Dudley decided to join the third World Warrior's tournament in order to win it back. Traveling around the world with his faithful butler, Kolin, Dudley searched for Gill. 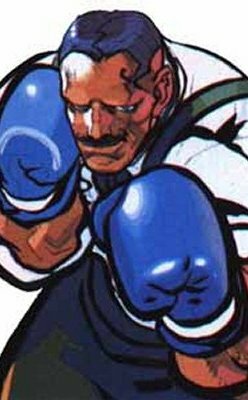 When he eventually found him, Dudley was defeated by Gill's brother, Urien. Dudley did not suffer a total defeat, however. He found that Gill had been defeated by Ryu, and the battered crime lord was being tended to by Kolin. Dudley demanded that his father's car be returned, and Gill reluctantly agreed. Dudley and hopped in the car and sped off, happy that he was able to reclaim his father's favorite possession.